Super easy, fluffy, and delish! 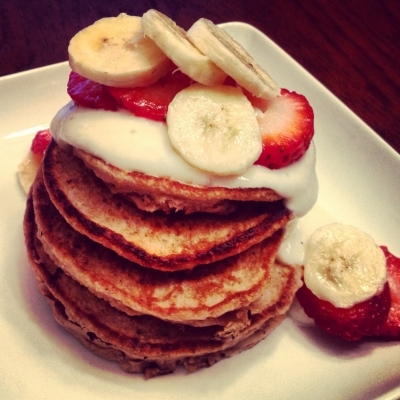 Pancakes you don't have to feel bad about. Boom! Directions: Mix all above ingredients (leave out 1/4 banana and 4 strawberries for toppings) in blender until you reach a batter consistency. Pour 1/4 cup of batter on greased skillet for each pancake. Makes about 10 small pancakes. I added vanilla whey mixed with plain nonfat Greek yogurt to top!